FILE - Singer-songwriter Carly Simon is seen in a New York studio in an Apr. 24, 2008, photo. Singer Carly Simon has revealed the mystery behind one of pop music's enduring puzzles: the inspiration for her 1972 hit "You're So Vain." Simon says the caustic song about a self-absorbed lover is actually based on a composite of three of the men in her life around that time, and one of them is actor Warren Beatty. "I have confirmed that the second verse is Warren," Simon told People magazine in an interview released on Wednesday pegged to her upcoming memoir, "Boys in the Trees." 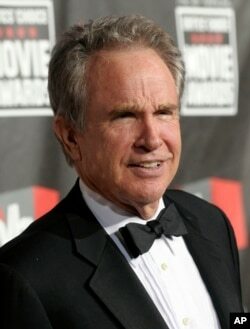 FILE - Actor Warren Beatty is seen arriving at the 16th Annual Critics' Choice Movie Awards in Los Angeles, Jan. 14, 2011. Simon, 70, says Beatty, the charismatic star of hit movies "Bonnie and Clyde" and "Shampoo," is aware of his role in the song, although, she said, "Warren thinks the whole thing is about him!" Simon, who had romances with singers Mick Jagger and Cat Stevens and actor Jack Nicholson as well as Beatty, is not naming other names, but in the past she has said the song was not about her then husband, singer-songwriter James Taylor. The hit single, with the chorus "You're so vain, you probably think this song is about you," reached the top of the charts in the United States, Canada, Australia and Ireland in 1972 and was Simon's biggest hit. Simon told People she was struck by the enduring interest in the song's inspiration. "Why do they want to know?" she said. "It's so crazy!"